A senior United Nations official was today named as James Cook University's 2012 Outstanding Alumnus. August 31, 2012: - A senior United Nations official was today named as James Cook University’s 2012 Outstanding Alumnus. 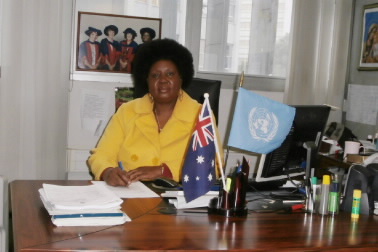 A former student and lecturer in the early days of JCU’s Cairns campus, Dr Rose Evaster-Aderolili is Chief of the Human and Social Development Program for the UN Economic Commission for Africa (UNECA). Now based in Addis Ababa in Ethiopia, Dr Evaster-Aderolili still has strong connections with Cairns – her son Peterson Opio graduated from Smithfiled this year with a BA in politics and international affairs. Dr Evaster-Aderolili will present a special lecture in the Crowther Theatre at JCU Cairns next Tuesday night (6.15pm, September 4). She was named Outsatanding Alumnus by JCU’s Chancellor Lt Gen John Grey at a special breakfast today in Townsville that honoured eight Outstanding Alumni from JCU’s four faculties and four Outstanding Early Career Alumni. JCU’s Vice Chancellor Professor Sandra Harding said that the University’s aim was to produce graduates and discoveries that make a difference. “Listening to the profiles of today’s awardees shows that JCU is producing outstanding alumni all around the world and they are doing an outstanding job,” Professor Harding said. Lt Gen Grey said that choosing one of the 12 as the Outstanding Alumnus had been very hard but Dr Evaster-Aderolili had an extraordinary record of achievement. After working as an economist in Uganda and a lecturer in Papua New Guinea, Dr Evaster-Aderolili joined JCU’s fledgling Cairns campus in 1991 as a student and was also the first lecturer in economics. She helped increase the number of economics graduates from Cairns and was awarded her Graduate Certificate of Education (Tertiary) and PhD in 1996. Joining the UN in 2001 as Economic Affairs Officer at UNECA, she was promoted to Chief Economist at the United Nations Mission in Sudan (UNMIS) where she dealt directly with humanitarian issues, advising on the needs of refugees. Her vision is for an Africa without poverty, disease or conflict and she wants to increase the economic and social development of a continent she believes has much potential. She also hopes to see Australia become more involved in international development agenda discourse. Last year the Human and Social Development Program, which she heads, became the first program to achieve 100 percent delivery, with the least resources. The African Union and UN also recently recognised Dr Evaster-Aderolili and her team for their significant contribution to Africa’s development.